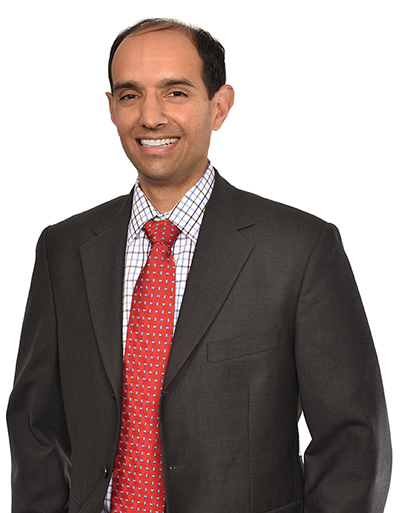 Sunjeev S. Sikand Shareholder | Washington, D.C.
Sunjeev Sikand is an IP attorney who works with clients to develop IP protection to protect their businesses. Sunjeev takes great pride in understanding his clients’ businesses and providing services that ultimately improve his clients’ market position and achieve business goals. As a trusted advisor and counselor, Sunjeev’s aim is to provide high quality legal services to clients by providing personal attention to each matter and leveraging his experience. With a decade of IP experience and a broad technical background, Sunjeev represents clients in the electronics, computer, automotive, medical device, and nuclear industries. His current clients develop technologies as diverse as lighting control systems, automotive seals, bone-tendon-bone allografts, and nuclear fuel. Litigation before federal district courts and the U.S. International Trade Commission. Providing opinions of counsel on non-infringement and invalidity issues. Counseling clients on freedom to operate, patentability, open source software compliance, and the Federal Acquisition Regulation (FAR). Handling contested matters before the Patent Trial and Appeal Board, including covered business method, post grant, and inter partes reviews. Advising clients on trade secret, trademark, and copyright protection. Preparing IP contracts and license agreements. With a hybrid of patent prosecution and litigation experience, Sunjeev is uniquely positioned to counsel his clients on how to build strong patent portfolios and prosecute patent applications with an eye towards enforcement. Sunjeev has drafted over 100 original U.S. patent applications and prosecuted several hundred U.S. and foreign applications. As a litigator, Sunjeev drafts summary judgment motions, claim construction briefs, and discovery related motions. He takes and defends both fact and expert witness depositions in both high stakes competitor cases and litigation involving non-practicing entities. Sunjeev recognizes that litigation is not a business goal, but rather a tool for achieving a business goal. For example, as recently reported in the Washington Post, Sunjeev and his colleagues at RatnerPrestia secured a preliminary injunction for a client. Sunjeev and the RatnerPrestia team then leveraged the preliminary injunction win to resolve a dispute over the ownership rights to a restaurant chain and related intellectual property. Sunjeev is currently a vice chair of the U.S. Patent Office Practice Committee of the Intellectual Property Owners Association. He frequently publishes articles in IP Law360 and is often quoted in IP Law360 on hot IP topics. Before his legal career, Sunjeev gained practical computer industry experience by working at L-3 Titan Group (now CACI) as an engineer for several years. While at L-3 Titan Group, he wrote software in the Java and Perl programming languages. During his undergraduate and graduate years, he was a teaching assistant for a course in compiler construction.